The image above shows the latest Sea Surface temperature anomalies (departure from average). 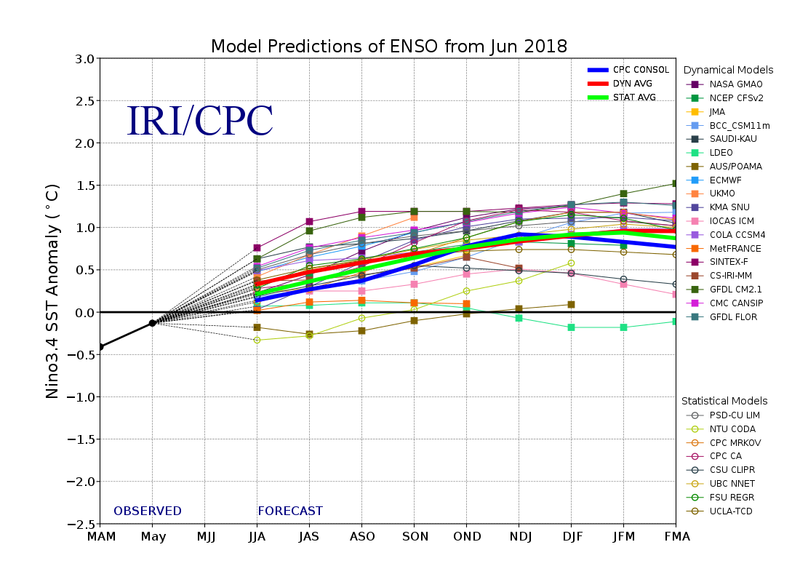 NOAA has issued an El Nino Watch and the latest global forecast models indicate that weak El Nino conditions will likely develop as we head into the latter half of Summer 2018 and continuing into the upcoming winter of 2018-2019. IRI/CPC Model Plume (image below) shows that most of the forecast models develop weak El Nino conditions that continue through the upcoming winter months. Given the late start to Summer, I expect a later start to Fall and Winter. However, unlike last year’s bitter cold, snow-less winter, the weak El Nino conditions would weaken the northern branch of the jet stream with a sub-tropical jet stream becoming more dominant. A more southern storm track would evolve placing the Mid-Atlantic big cities of DC, Baltimore, Philly, and New York in a much better position to be impacted by Nor’easters. Overall, I would also expect temperatures to be much more mild than last year’s bitterly cold winter.